A tropical storm system brought heavy rain into San Diego’s South Bay early Tuesday. Throughout the day, much of the County got pelted by showers, some of them heavy. Throughout the afternoon and into the evening, many San Diegans saw widely scattered showers. The rain brought trouble to San Diego's roads and several crashes slowed traffic. "People can't drive. People definitely can't drive down here," said resident Cody Yates. "You've got people going 40 in the fast lane and people honking at each other. Definitely crazy down here." County Vector Control officials say any puddles or standing water that may accumulate as a result of the rain are no different than sprinklers creating puddles. Officials asked residents to canvas their yards and dump puddled water within a week, because it takes that long for mosquitoes to breed and hatch. When it gets colder, it's not as big of a concern because the mosquitoes prefer the warm humid air. Officials are not concerned about the spread of Zika with this rain. 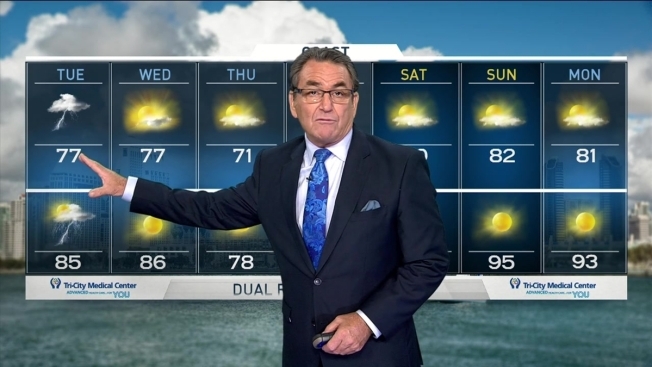 By Wednesday afternoon, most of the rain should be gone and NBC 7 Metereologist Kimi Evans forecasted sunshine for the final hours of summer.